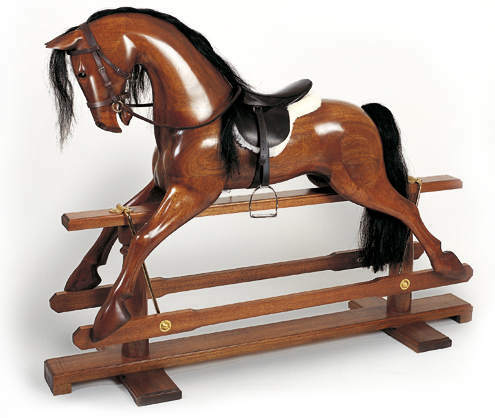 The grace and elegance of a natural wood rocking horse is unmistakable and the gorgeous mahogany rocking horse we picture has an understated poise and dignity. At the vital finishing stage, the rocking horse is carefully French-Polished by hand to a shine, which never overpowers in the way which modern lacquers often do. A wax is then applied which gives a depth of finish which surpasses that obtained by 'short-cut' methods used by others. The fittings are finished in brass. Those who appreciate the finest furniture will readily recognise the marriage of the best of traditional rocking horse making and traditional furniture making. The natural wood horse can be made from several different woods.